Last weekend’s blizzard along the East Coast of the United States caused significant flooding along the coasts of Maryland, Delaware, New Jersey, and New York. Even though this system was not a tropical cyclone, the mechanics of storm surge flooding are essentially the same whether the cause is a hurricane or extratropical storm. The blizzard provides us an excellent opportunity to delve into the topic of vertical datums, which we promised to tackle in a previous blog post anyway! Simply put, a vertical datum is a reference level. Whenever you talk about water levels related to tides or storm surge, that water level needs to be referenced to some datum to provide essential context. For example, a water surface 2 feet above the floor means something very different than a water surface 2 feet above the roof. There are many vertical datums out there. Some are based on tide levels (tidal datums), while some are based on the general shape of the Earth (geodetic datums). Savvy and more technical experts generally use geodetic datums such as the North American Vertical Datum of 1988 (NAVD88) because they’re more precise and applicable to a large area, such as an entire continent. For most of us, however, we see water levels referenced to tidal datums such as Mean Lower Low Water (MLLW) or Mean Higher High Water (MHHW). Some locations along the coast have two high tides and two low tides per day (e.g., the U.S. East Coast), while some areas only have one high tide and one low tide per day (e.g., the U.S. Gulf Coast). Mean Lower Low Water (MLLW) is simply the lowest of the two low tides per day (or the one low tide) averaged over a 19-year period. This 19-year period is called the National Tidal Datum Epoch, which currently runs from 1983 through 2001. So to calculate MLLW for a particular tide station, the National Ocean Service (NOS) took the levels of all the lowest low tides from 1983 to 2001 and averaged them. Similarly, NOS calculates Mean Higher High Water (MHHW) by averaging the highest of the two high tides per day (or the one high tide) over the same 19-year period. 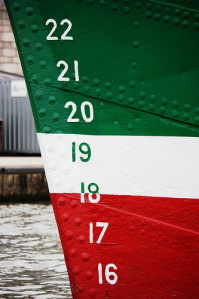 Numbers on the bow of a ship that mark the ship’s draft in the water. Historically, MLLW has been used for navigational purposes in the marine waters of the United States and its territories. Navigational charts from the NOAA Office of Coast Survey show water depths relative to MLLW, or how far the ocean bottom extends below the MLLW line. If boaters know the tide forecast relative to MLLW, the depth of the ocean bottom relative to MLLW, and the draft of their boat or ship (the distance between the waterline and the bottom of the hull), then they can deduce if the vessel will hit the sea floor. 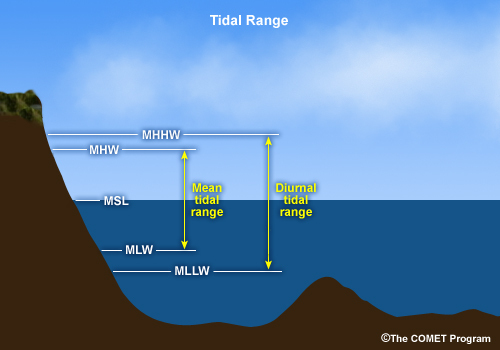 Since this is the most common way that tides have been referenced, the National Weather Service (NWS) has generally used MLLW as a reference for its water level forecasts, and most tide gauge data is referenced to MLLW by default. People who have lived along the same stretch of coastline for many years have become accustomed to knowing what type of coastal flooding will occur when water levels reach specific thresholds above MLLW. 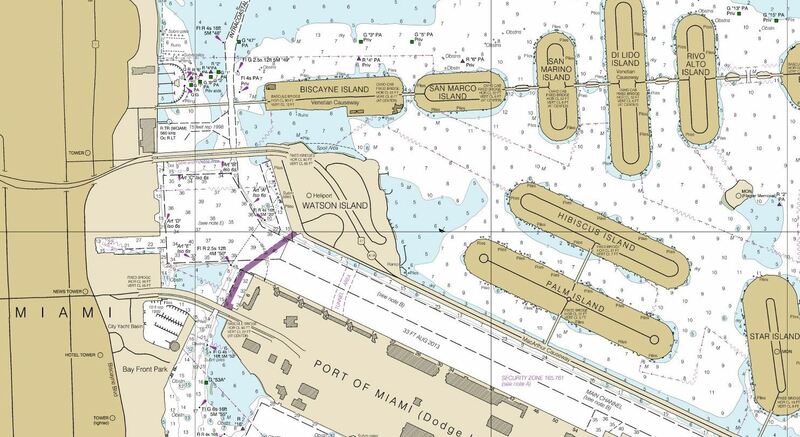 NOS Office of Coast Survey nautical chart of the Port of Miami and Biscayne Bay. The chart shows water depths in feet relative to Mean Lower Low Water (MLLW). But what about people who don’t know those relationships between MLLW–or any other datum for that matter–and coastal flooding (which change from location to location along the coast, by the way). For this reason, NHC has moved toward providing tropical cyclone related storm surge forecasts in terms of inundation, or how much water will be on normally dry ground. You can go here for more information on the Potential Storm Surge Flooding Map, issued by NHC when tropical cyclones are forecast to affect the East or Gulf Coasts of the United States. For the purposes of using water level observations to get an idea of how much inundation is occurring during a storm, NHC uses MHHW. Why Does NHC Use MHHW When Looking at Water Level Observations? To answer this question, it’s probably helpful to look at a cross-section of a typical coastline. Shown below is such a schematic, which depicts both the Mean Lower Low Water line and the Mean Higher High Water line. Anything seaward of the MLLW line is typically submerged under water. 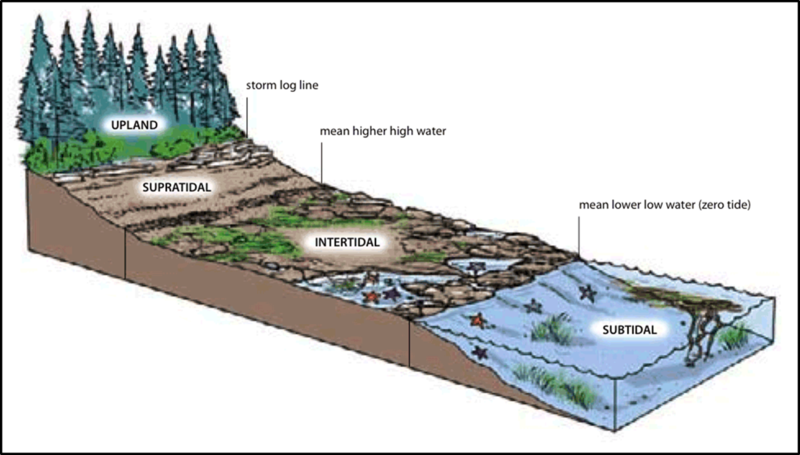 The region between the MLLW and MHHW lines is called the intertidal zone, and it is the region that is submerged at high tide and exposed at low tide. Intertidal zones include rocky shorelines, sandy beaches, or wetlands (marshes, mudflats, swamps, and mangroves). Because intertidal zones are submerged during a typical high tide, people don’t generally live here. Schematic of tidal zones. Illustrated by Soren Henrich. NHC and NOS consider anything landward of the MHHW line (marked as the supratidal zone in the graphic) as normally dry ground. Only in the most extreme high tide cycles and during storm surge or tsunami events does that region become submerged under water. Seawater that rises past the MHHW line is considered inundation, and therefore water level measurements relative to MHHW can be considered as proxies for measurements of inundation. NOS has deemed MHHW as the best approximation of the threshold at which inundation can begin to occur. While safe navigation of boats is a downward-looking problem that requires the use of MLLW, coastal flooding is an upward-looking problem that is best communicated using MHHW. that varies from place to place. additional rise to expect above the highest levels of the astronomical tide. We should mention that use of other vertical datums is in no way wrong. 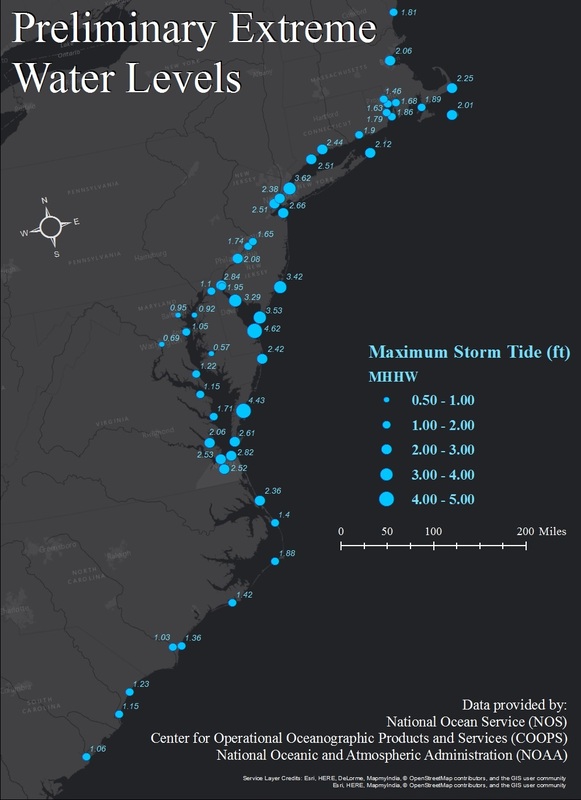 There are some very good uses for datums such as MLLW or NAVD88, but NHC uses MHHW when referencing storm tide observations to put things into a frame of reference that is understood by the majority of people at risk for coastal flooding. If we see a water level observation of 7 feet above MHHW, there’s a pretty good chance that some location in that area is being or was inundated by as much as 7 feet of water on ground that would normally be dry. This relationship worked quite well during Hurricane Sandy in 2012. Peak water levels measured by NOS tide gauges at the Battery in Manhattan and Sandy Hook, New Jersey, were between 8 and 9 feet above MHHW, and high water marks surveyed by the US Geological Survey after the storm indeed supported inundations of 8 to 9 feet above ground level in places like Sandy Hook and Staten Island. Since we said the recent blizzard provides a great case for us to explain vertical datums, let’s take a look at some of the water level observations during the event and how they compared to documented flooding. Preliminary peak water levels in feet above MHHW from NOS tide gauges along the East Coast of the United States during the January 2016 Blizzard. Image created by Cody Fritz of the NHC Storm Surge Unit. Some of the worst storm surge flooding from the event occurred in extreme southern New Jersey and Delaware. So let’s look at the area around Cape May, New Jersey. 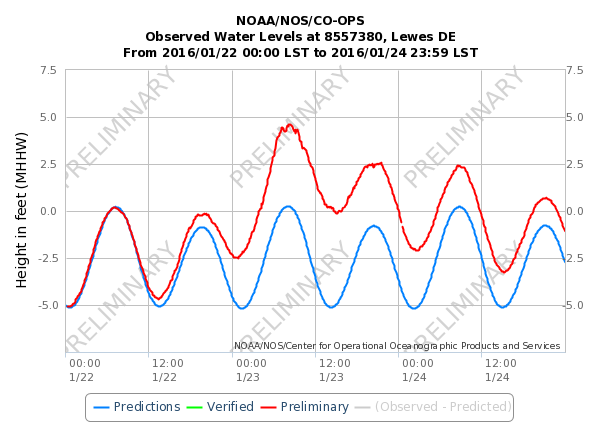 The NOS tide gauge at Cape May measured a peak water level of about 9 feet above MLLW (8.98 feet to be exact). 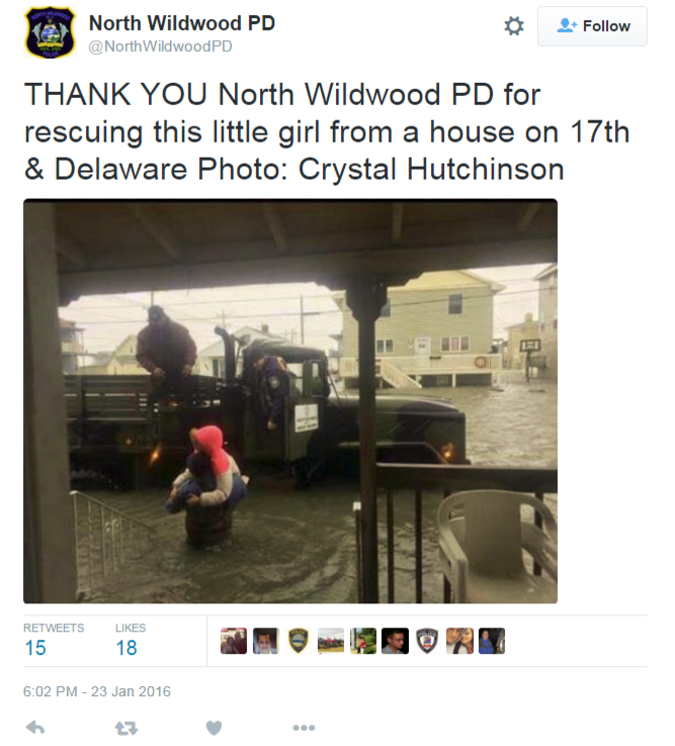 But does that mean that residents of Cape May and surrounding communities had as much as 9 feet of water on their streets? No, it just means that the water surface got about 9 feet higher than the “imaginary” line that marks the average of the lowest of the two low tides per day. At the Cape May gauge, the difference between MLLW and MHHW is 5.45 feet, which means that the peak water level was only about 3.53 feet above MHHW (8.98 minus 5.45). Nearby, the peak water level observation from the NOS gauge in Atlantic City, New Jersey, was 3.42 feet above MHHW. 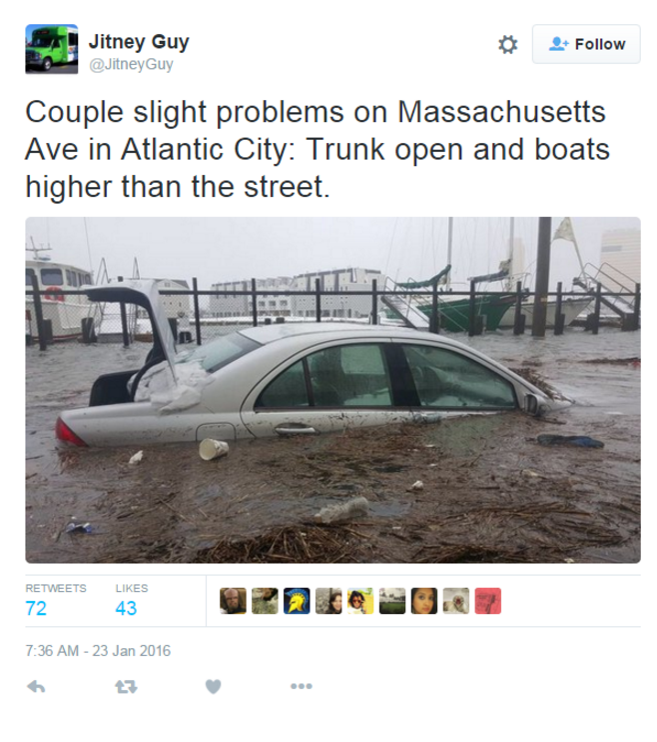 So does that mean that residents of Cape May, Atlantic City, and surrounding communities had as much as 3 to 4 feet of water on their streets? Actually, yes it does. 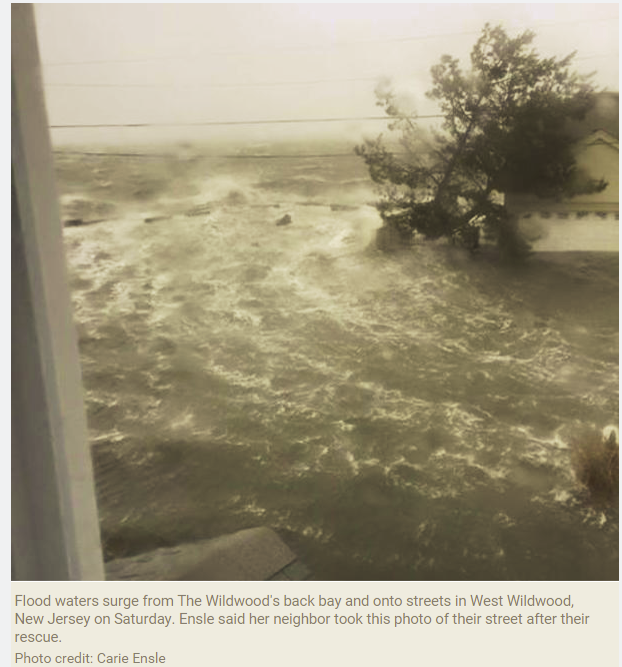 Pictures obtained via Twitter from West Wildwood, North Wildwood, and Atlantic City appear to support an estimate of 3 to 4 feet of inundation. See below for the evidence. Incidentally, if you’re ever watching water level observations during a storm from the NOS Center for Operational Oceanographic Products and Services (CO-OPS) website, you can choose which vertical datum you’d like to use. The default will come up as MLLW, but you can change it to MHHW (as we do at NHC) or another datum such as NAVD88 or Mean Sea Level. Alternatively, NOS CO-OPS also provides a real-time “Storm QuickLook” website during coastal flooding events, and the default vertical datum on this page is MHHW. Below is a comparison of the water level data from Lewes, Delaware, during the blizzard using MLLW (top) and MHHW (bottom) as reference levels. Notice that the curves don’t change, only the reference numbers on the left vertical axis. 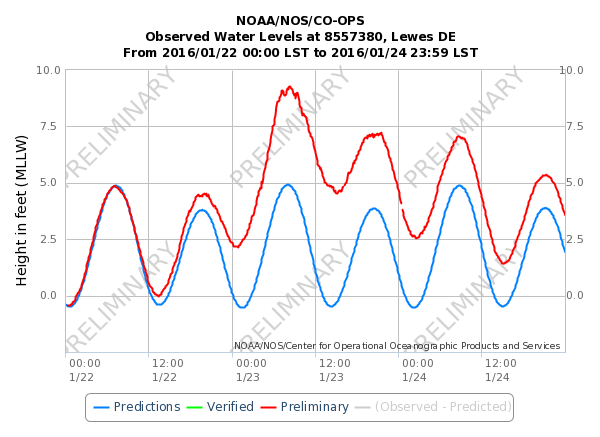 Tide predictions (blue line) and actual water level observations (red line) relative to MLLW from Lewes, Delaware, during the January 2016 East Coast blizzard. Courtesy NOS/CO-OPS. Tide predictions (blue line) and actual water level observations (red line) relative to MHHW from Lewes, Delaware, during the January 2016 East Coast blizzard. Courtesy NOS/CO-OPS. And finally, if you’re ever looking at storm surge forecast guidance online, make sure you know which vertical datum you’re looking at! For example, the NWS’s Extratropical Storm Surge (ETSS) model is available on the Meteorological Development Laboratory website, and although data shown is relative to Mean Sea Level (MSL), the vertical datum can be changed to MHHW or MLLW. Thanks go out to Cody Fritz, Shannon Hefferan, and Jamie Rhome from the NHC Storm Surge Unit, as well as the folks over at the National Ocean Service, for their assistance in putting together this blog post. This entry was posted in NHC, Storm Surge and tagged Atlantic City, Blizzard, Cape May, datum, Delaware, Jonas, Lewes, MHHW, MLLW, NAVD88, New Jersey, vertical datum. In our last storm surge post, we talked about the need for a storm surge graphic and why we use “above ground level” to communicate storm surge forecasts. Now we’ll discuss how we create the new storm surge graphic. But first, we need to touch on how forecast uncertainty relates to storm surge forecasting. The exact amount of storm surge that any one particular location will get from a storm is dependent on a number of factors, including storm track, storm intensity, storm size, forward speed, shape of the coastline, and depth of the ocean bottom just offshore. Needless to say, it’s a complex phenomenon. Although we’re getting better on some aspects of hurricane forecasting, we still aren’t able to nail down the exact landfall of the storm or exactly how strong and big the storm will be when it reaches the coast. This means that there is a lot of uncertainty involved in storm surge forecasting. Here’s an illustration showing why all of this is important. The forecast has this hurricane making landfall near Dauphin Island, with the center moving northward just west of Mobile Bay along the black line. 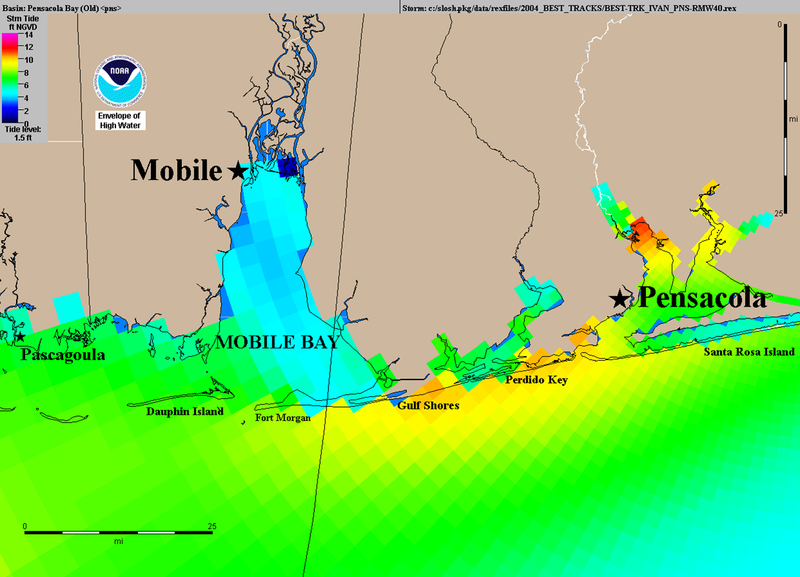 You can see from this map that water levels will rise to at least 14 ft. above NGVD29 (the particular reference level we are using in this scenario) in the upper reaches of Mobile Bay while they will rise to about 2 ft. above NGVD29 in the Pensacola area. What’s the problem with this storm surge forecast? It assumes that the track, intensity, and size forecasts of the hurricane will all be perfect. This is rarely, if ever, the case. 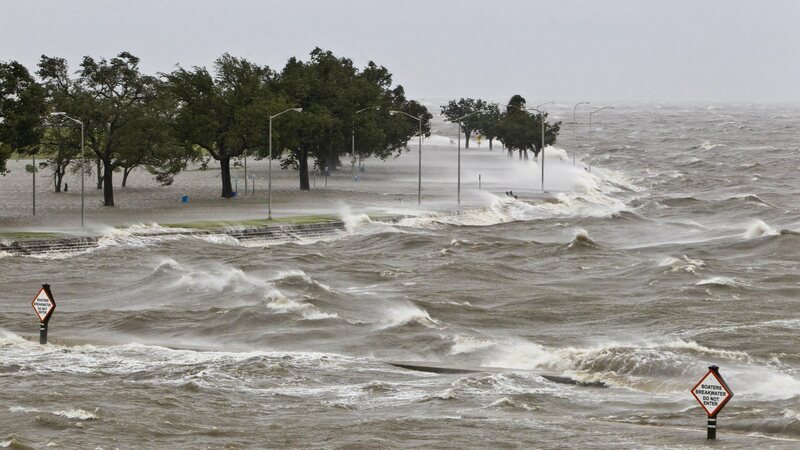 Since the center of the hurricane actually moved east of Mobile Bay, winds were pushing water out of the bay, and the water was only able to rise about 4-5 ft. above NGVD29 near Mobile. On the other hand, significantly more water was pushed toward the Pensacola area, with values as high as 12 ft. above NGVD29 in the upper reaches of Pensacola Bay. 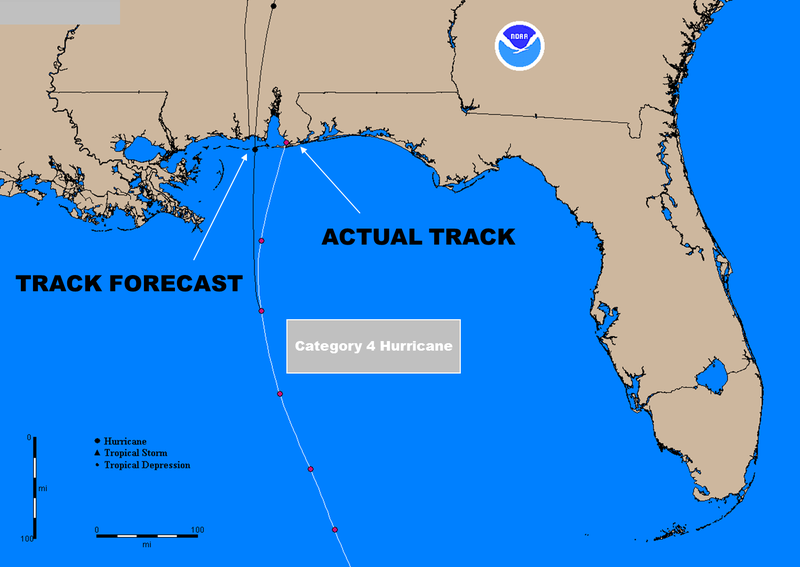 This scenario was an actual storm–Hurricane Ivan in 2004. 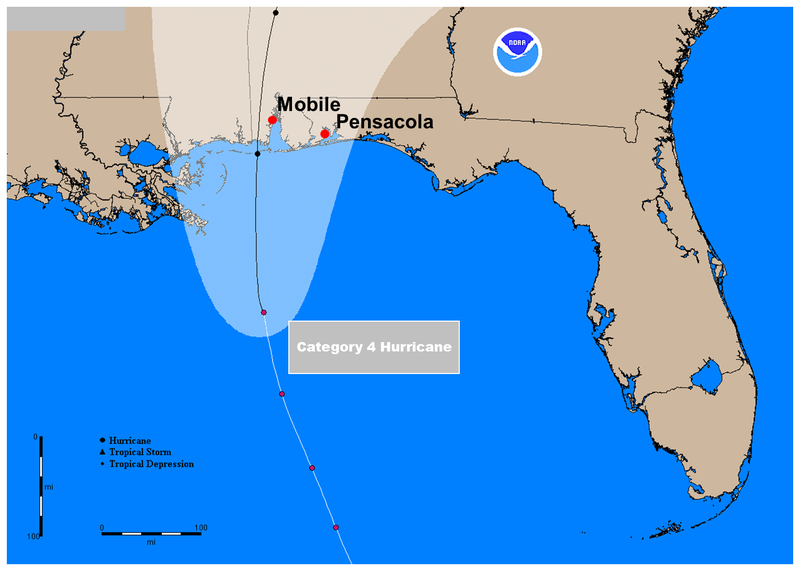 If emergency managers in Pensacola at the time had relied on that single SLOSH map that was based on a perfect forecast (or, put all their eggs in one basket), they would have been woefully unprepared and may not have evacuated enough people away from the coast. Granted, such decisions would have been made more than 12 hours away from landfall, but at that time, forecast errors are even larger and make storm surge forecasting even more difficult. If you’re going to put all your eggs in one basket, you might as well scramble them beforehand so that they don’t break when you drop the basket. In a sense, that’s what we do when trying to assess an area’s storm surge risk before a tropical cyclone. Instead of assuming one perfect forecast, we generate many simulated storms weighted around the official forecast–some to the left, some to the right; some faster, some slower; some bigger, some smaller–and then run each of those storms through SLOSH. We then “scramble” the SLOSH output from all storms together and derive statistics that tell us the probability of certain storm surge heights at given locations along the coast. If we go back to our example from Hurricane Ivan, we can see the value of this method in assessing storm surge risk. The image below shows the probability that the storm surge would reach at least 8 ft. above the reference level (NGVD29) for Ivan from the NHC Tropical Cyclone Storm Surge Probability product. 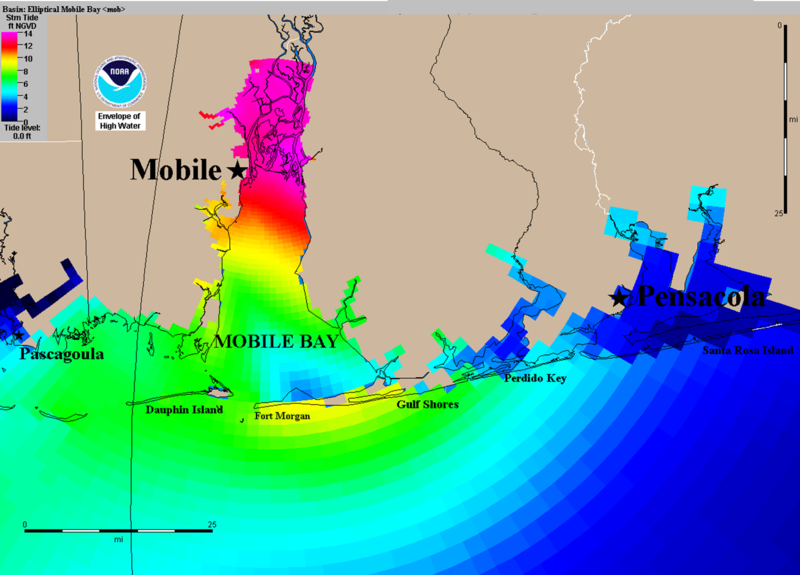 The first thing that should jump out at you is that the probability of at least 8 ft. of surge was just about equal in Mobile Bay (60-70% chance) and Pensacola Bay (50-60% chance). The probabilistic approach indicates that both areas were at a significant risk of storm surge, and both areas should have been preparing similarly for the arrival of the storm. Because we accounted for the uncertainty in the official forecast, we were able to assess the true storm surge risk for all areas near the coast. 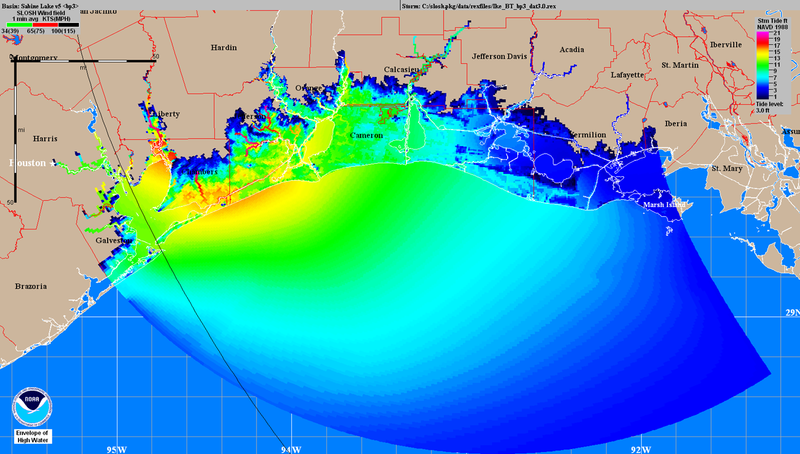 The Tropical Cyclone Storm Surge Probability product provides the data that are used to create the Potential Storm Surge Flooding map that will be available experimentally beginning in the 2014 hurricane season. 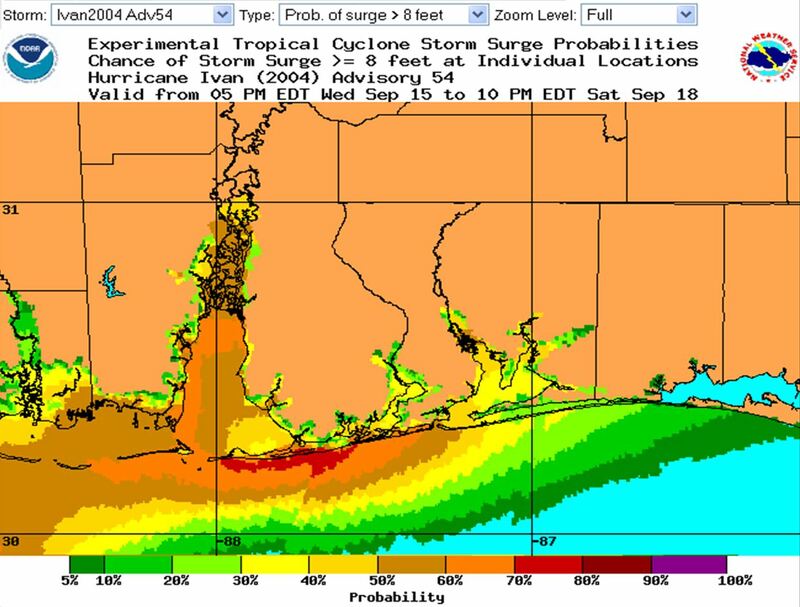 In other words, the Potential Storm Surge Flooding map accounts for the uncertainties associated with NHC’s tropical cyclone forecasts. In Part 3 of this storm surge series, we’ll talk more about the map itself and how it should be interpreted. 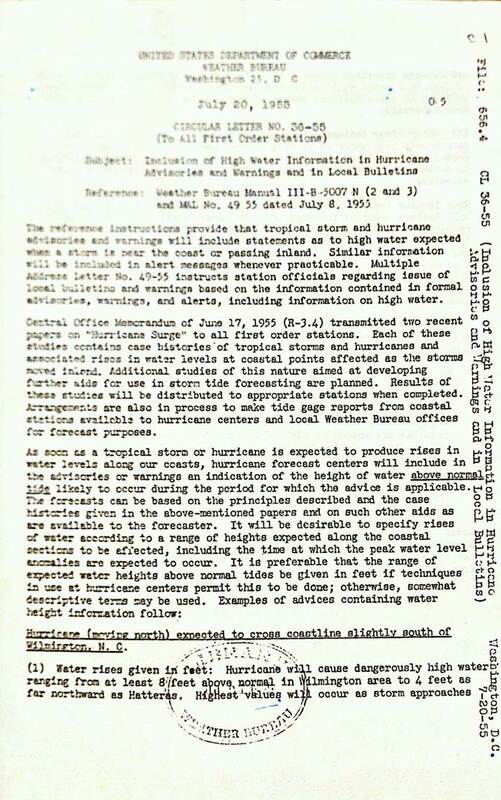 This entry was posted in Forecasting, NHC, Storm Surge. Part 1: Why do we need a storm surge graphic? Part 2: How is the storm surge graphic created? 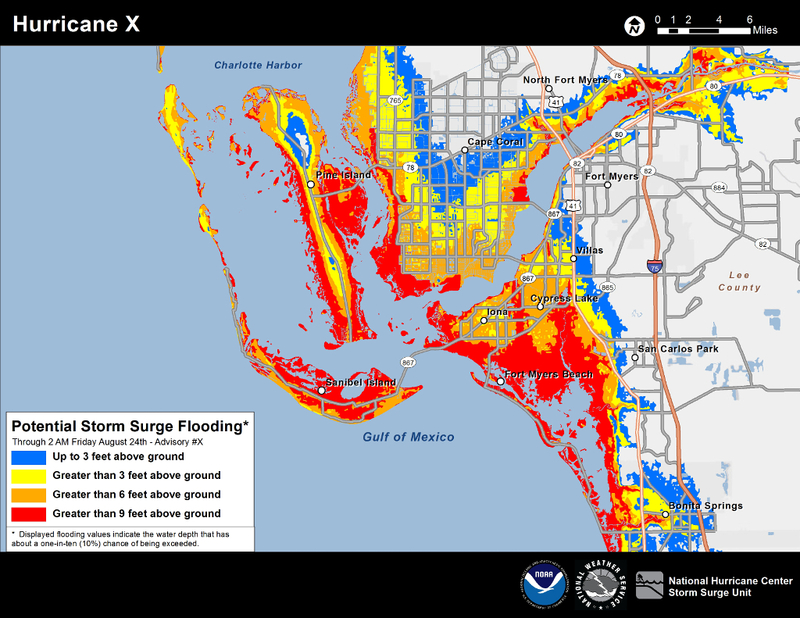 Part 3: How should you interpret the storm surge graphic? Another issue had to do with what are called vertical datums. We’ll leave the more technical discussion of vertical datums for another blog post, but what you need to know for this discussion is that a vertical datum is simply a reference point. The water level height caused by the combination of storm surge and the tide must be attached to some point of reference. The operative question is “the height of the water level is 6 feet above what?” The problem was that many people either weren’t specifying what the datum was, or they were confusing one datum with another. Here’s an example, again using Ike, where confusion set in. The figure below shows output from the National Weather Service SLOSH model indicating simulated water level heights from Hurricane Ike along the Texas and Louisiana coasts. What’s the first thing that jumps out at you? The first question many people have is why do the values increase (go from 15 feet to over 21 feet) as you move inland from the coast into Chambers and Jefferson Counties in Texas? Shouldn’t the deepest water have occurred at the immediate coast? The subtlety here is that the water level in this picture is depicted relative to a datum called NAVD88. So, the water levels in Chambers and Jefferson Counties were more than 21 feet above NAVD88, not 21 feet above the actual ground at those locations. Luckily, there’s a way to display how much water was sitting on normally dry ground, which is what most people typically envision when given storm surge heights. Since we know what the elevation of the land is at each location, relative to the same vertical datum used for the surge data itself, we can subtract the land elevation from the surge heights to get a good idea of how high the water was above the ground at each location. The next figure is the same simulation for Ike but instead shows this subtraction at play. Notice any differences from the previous image? Now it should all make sense. The highest values (about 15 feet above ground level) are located along the immediate coast and decrease as you move inland. Recent hurricanes like Katrina, Rita, and Ike showed that we needed to make some changes in the ways that we communicate storm surge information. And thankfully, we now have the technologies and capabilities to go beyond simplified text statements in the Public Advisory. 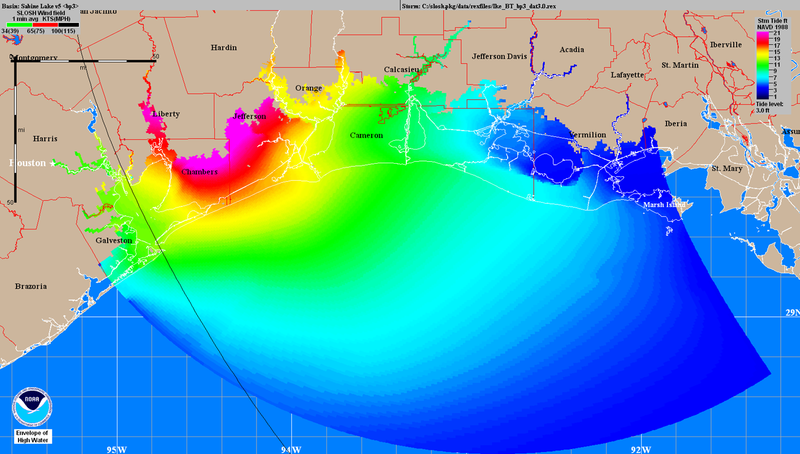 In Part 2 of this series, we’ll talk about the Probabilistic Storm Surge product, how it accounts for uncertainties in the storm surge forecast, and how it is being used to create the Experimental Potential Storm Surge Flooding Map for this hurricane season. This entry was posted in Forecasting, NHC, Storm Surge and tagged Ike, inundation, Storm surge, storm surge graphic, vertical datum.